I’ve taught a number of classes recently to people who are just getting started as software developers either as a way to change careers and move into our profession or just to people who love computers and want to learn more about how to program. I personally love these types of classes as they differ so much from the standard SharePoint or Silverlight type course where the average student is fairly skilled and the questions and interaction from students is very technical. In an introduction type class, everything moves at a much slower pace and the “theory”, while basic to many of us who have been doing this for a long time, is much more the focus. Simple things like variables, conditional statements, loops, etc are the focus and we get our hands dirty with some simple console applications. While many of us with a few years of experience in this industry know and love the power available in VS.NET, I frequently get the pleasure of watching the eyes of students during the first night of class when we double click the icon and Visual Studio loads for the first time in all it’s toolbar and dock-window filled glory. It’s definitely an overwhelming experience that is soon coupled with creating a new project and having to decide between VB.NET/C#/WCF/WPF/Windows/Web (Site or application or MVC? )/Workflow (Sequential or state machine? )/Office/Etc/Etc… Obviously VS.NET brings a lot of power to developers of many skill levels but getting started as a developer with all the tools and technologies available today is a bigger undertaking than many people realize. 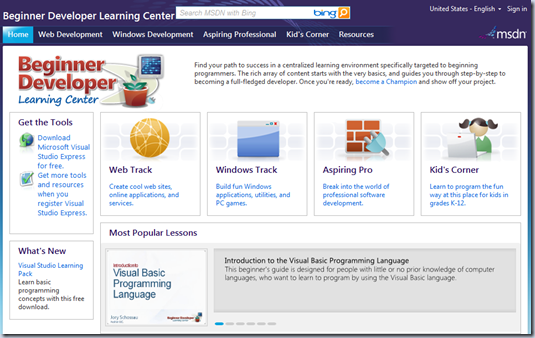 Recently Microsoft released a great site chock full of resources for the beginning developer. It’s called the “Beginner Development Learning Center” and can be found here: http://msdn.microsoft.com/en-us/beginner/default.aspx. 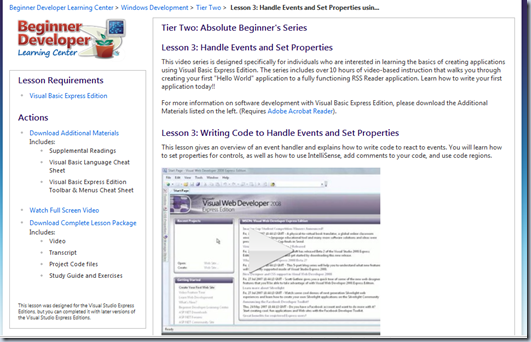 -Web Track – Learn the basics of creating web applications, online applications, and services. -Aspiring Pro – Learn about the tools and technologies required in a professional development environment including source control and other ALM tools. -Kids Corner – A GREAT resource and set of fun projects to introduce kids to software development. Each of the above tracks is broken into 3 tiers and include a progressive series of lessons focusing on the basic skills necessary to get started as a developer. 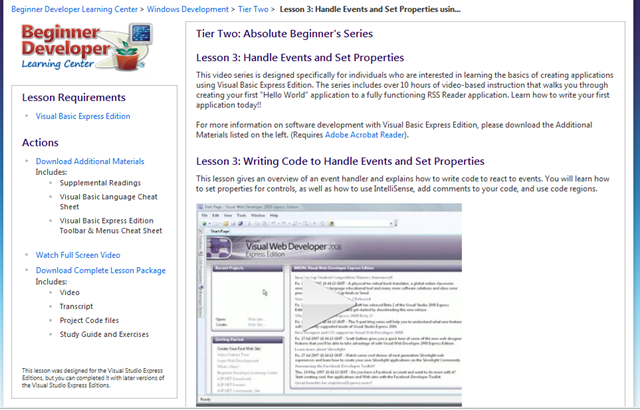 Each section includes links to download the necessary tools for working through the lessons (including VS.NET 2008 Express editions). Each section also includes links to additional learning resources outside of this site that students can refer to as they work through the lessons. In addition to external resources, a Tips and Tricks section helps students better learn the tools and technologies they might be using on a specific Track. The lessons themselves vary per topic and include things such as full video, audio/podcasts, full transcripts, supporting projects and other source files, lesson plans, additional resource links, and relevant articles. 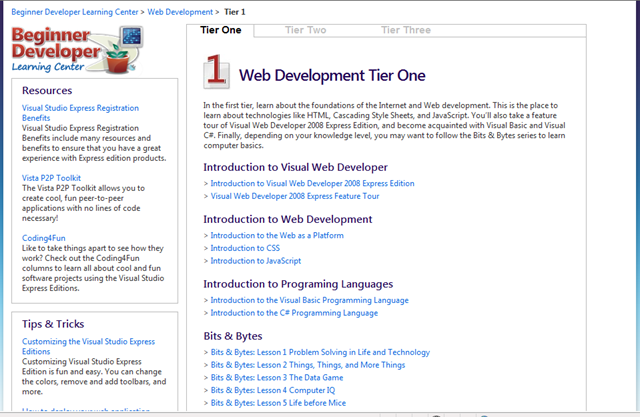 The screenshot below provides an example of the Web Development Tier One lessons. I think the organization and material provided on this site is excellent and I highly encourage anyone interested in learning to develop software to consider this a great self-paced starting point to begin to move in that direction. With enough focus to work methodically through the various tiers of content on any track (or all of them) a student would have a very solid foundation on which to begin contributing to larger projects and possible further their career goals. The final area of this side I wanted to discuss was the Kid’s Corner section. This site is intended to introduce kids to software development through a series of fun and challenging lessons to which they can relate. For example, some of the web lessons have them developing a web site for a Rock band. Where was this type of lesson when I was a kid? The site includes articles and videos of varying levels of complexity (i.e. Beginner, Intermediate, and Advanced). 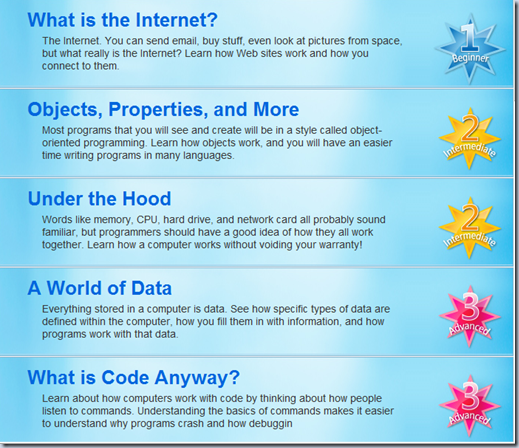 It also includes links to fun projects and other resources that kids will find interesting. 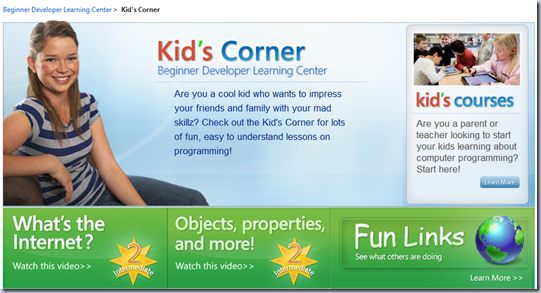 Another great thing about the Kid’s Corner is the fact that includes lesson plans and content targeting parents and/or teachers which they can use as part of their own plan for educating children either at home or in our schools. 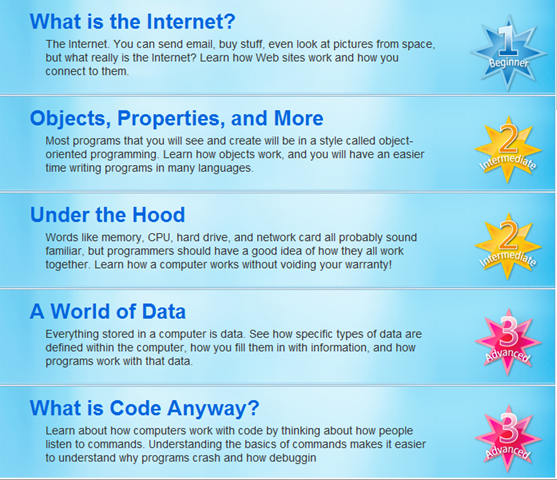 As a father of 3 daughters (ages 11,10, and 8) my girls are definitely at that age where they have the capability (and interest) to work through much of the content on this site and I’m eager to get them started to see how far they go before dad has to start providing “development and debugging” support. In closing, I have a few more great training resources I will be blogging about shortly…but, for now, let me know what you think of this resource for beginning developers and PLEASE share it with people you know are trying to get started and could benefit from something like this. Thanks for doing something for beginners and kids.Now i think beginners can easily learn development From Microsoft..
You are right universities are not doing enough job of educating today's developers i am a final year student and I had to take some Dissertation Writing Help by Dissertation Club to clear my concept on development or I had to read lots of article like yours to keep myself updated of latest development techniques or tools. <a href="http://www.writerhelp.edublogs.org/2016/11/01/are-online-colleges-accredited”>Are Online Colleges Accredited Yes, obviously, the online universities are certified, yet not every one of them. This implies while getting affirmation you are required to take a few things among which affirmation of the validity of the online school should dependably stay on the highest priority on the rundown. When you are thinking about going to school through a separation educational program, finding an honest to goodness online degree can challenge while rest aspects such as assignment writing help is usually found more easily. However, numerous licensed schools and colleges do offer online projects. There are likewise revenue driven foundations, or recognition processes, which take the cash of clueless benefactors in return for an insignificant degree. Follow the below provided rules to remember in order to get admission in an accredited college. Blog is so nice, Thank you very much for your information, nice job continue your work. How to Select a 1 Click Dissertation Since they differ from the DISSERTATION type course where the student is proficient and the interaction and questions from students is extremely technical, personally, I love these kinds of classes. I really do appreciate and compiler writing in college BUT I wish I could've heard more about ALM tools like source control and bug tracking systems and methodologies.